Your brain is an unfathomably powerful machine, capable of incredible things. It really does have the capability to help you get what you want from life and so much more. But the problem is that most of us have no idea how to use it. This is not only a very powerful machine but also an impossibly complex one. And it doesn’t come with an instruction manual. The result is that we often seem at odds with our brains. We want to do one thing, but our brain seems to want to do another. We want to focus on work and get lots done, but our brain just wants to eat cake. We want to be creative and come up with amazing ideas, but our brain draws a blank. A lack of control over our brains leaves us completely at the whims of our biology and means that it becomes very hard for us to set goals and stick to them. We end up floundering rather than being able to go after the things we want and it all results in us being less happy and less successful. So how do you change all that? How do you take back control and harness that mind power? In this guide, you’ll learn precisely how to do that and how to get your mind to work for you and not against you. First though, we’ll begin with a little lesson about what your brain is and what it isn’t – and how it attempts to help you. We’ll look at why it can sometimes seem like it’s being belligerent. The first thing to remember is that, as with your body, your brain is not designed to work in today’s modern environment. Your brain was designed to help you survive in the wild, which essentially meant avoiding getting eaten and making sure you stayed well-fed. It meant keeping you warm and dry and out of the rain and it meant ensuring you passed on your genetic material. What your brain isn’t designed for is sitting in an office and working to the deadline. It’s not interested in getting you out of debt so much either. So, bearing in mind the priority is to keep you alive, that means it’s mainly focussed on registering the things going on in your body and physiology. To do this, it converts your feelings and your sensations into emotions and into ideas. We think we’re sad because we had a bad day. We are not. We had a bad day because we are sad. And why are we sad? Possibly it’s because we’re overtired, maybe it’s because we’re underfed! Or at least this is often the case. In other words, your body responds to what’s going on around it and then produces relevant emotions to ensure that you get things done. We know this on a basic level but you probably aren’t aware just how deep the rabbit hole goes, or how fundamentally important your physiological signals are to your wellbeing. When you are hungry, this means you have a dip in blood sugar. That dip in blood sugar then results in your energy levels dipping and that, in turn, sends alarm bells to the body. It produces ghrelin to make you feel hungry, but it also produces cortisol – the stress hormone. The objective here is to motivate you into getting out there and doing what you need to in order to get fed. This cortisol rushes through your brain and makes you anxious and angry – which is why people get hangry! The result might be that you have an argument with your other half and end up upsetting them. If only you had stopped to consider that maybe you were just hungry! What happens when you eat? You have a release of sugar in your bloodstream and when this is absorbed, it leaves behind hydroxytryptophan, which is converted to serotonin. Serotonin is the feel-good hormone and so as a result, you feel great. Later, this converts into melatonin – the sleep hormone. Struggling to get your work done? Struggling to focus on what you need to? Could it be because you just ate? Would you be more productive if you shifted your routine and priorities round a little? There are many more examples. If you’ve had brain fog, this could be because flora in your gut are producing mycotoxins! Fixing your diet might help that. Or maybe you don’t have enough positive bacteria? It could be down to the fact that you have an underlying illness that is causing inflammation via pro-inflammatory cytokines. These actually work as inhibitory neurotransmitters, causing you to become less productive and making you struggle to focus. Even the temperature affects how awake and focussed you are. And the way you breathe. So, if you want to get the most out of your brain, the first thing you need to do is to better understand the link between your brain and your body. Your body defines the way you feel and if you want to feel positive, driven, energetic and motivated then you need to make sure you support that with the right diet, the right lifestyle and more. You need to sleep. You need to eat. You need to fix your schedule so you are being productive at the times when your body naturally peaks. Simply giving yourself the right nutrients and getting more sleep, maybe spending more time outdoors, is going to help you to get more from your brain. We need to go further than that. And of course you are aware that there is also a cognitive aspect. What you think and what happens in your routine can also impact on the way you perform. You can also have a bad day because your partner dumps you. Or because you get fired. The answer lies with the very way the brain works and the way it understands information. What happens when you ‘think’? The answer is that you visualize things happening. And the way you do this is by activating brain regions as though the thing were happening. This is also how we translate language into something that our brain innately understands. So when someone tells you a story of how they trekked through the woods, you picture yourself doing that. The same brain areas light up as though it were really you trekking through the woods. You might feel slightly cool as the wind blows against you, you might feel the branches break underfoot. Or you might not be aware of it at all – it all happens quickly and faintly and we tend not to register it. But the point is that as far as your brain is concerned, you are walking through the woods. It’s not going to burn calories but by simply imagining being somewhere calm, or by reading about a calm situation – you can stimulate the same response from your brain and body. You can go into a calm, relaxed and creative state (we are most creative when we relax!). And what this means is that you can also trigger changes in your mental state and your body simply by imaging things. And by picturing your future. So when someone tells you-you are in debt, you may – even unconsciously – picture yourself being homeless, being audited, being shouted at by your partner. You picture things that do have an impact on your wellbeing and physiology. And your body responds in kind: as though you were in real physical danger. This is what causes the sudden response of increased heart rate, of rapid breathing, of contracted muscles and of suppression of the immune system and digestion. This is how the body responds to threat, this is the ‘fight or flight response’. And if you really are being chased by a lion then it is great. But if you’re sitting in your office, it’s no use at all. And if the stress is ongoing – chronic as we call it – then it can actually be very harmful and can cause long-term damage to your health. But you can take back control. The first way you do this is by deciding to protect your physiology as we’ve already discussed. This response will be less unfavourable if you are well-fed if you have had a good night’s sleep, if you’re a comfortable temperature, if you’re healthy. But at the same time, you can also choose to change the way you react to these situations. Remember: it isn’t that news that it making you scared, but rather it is your own reaction to that news. You are only stressed because you have pictured a certain outcome. Therefore, it is entirely possible that you can choose to picture a different outcome and have an entirely different response. If you choose to think it’s going to be okay, if you recognize that even your worst fear isn’t that bad – then you can respond in a calm and effective way. I often use a specific example to illustrate this point and the importance of our interpretation of events. Imagine that you’re in a caravan that has crashed and is hanging off the edge of a cliff. You look out the window and you see that it’s teetering. You go into the panic: sweat beads on your forehead and you start breathing rapidly. But unbeknownst to you: the emergency services have already arrived and they’ve attached a chain to the caravan, safely holding it in place. Once you learn of this, everything is okay! So the situation hasn’t really changed. The only thing that has changed is your perception of events. Your belief. And that completely alters your physiology and your mental state. This is the central tenant of an ancient school of philosophy called Stoicism. The entire idea behind Stoicism is that we need to embrace the possibility of bad things happening. Stoics claim that there is no benefit in blind optimism. In wishing for a happy ending. Instead, we must accept that life will be tough but in doing so, we can prepare for that toughness, we can come up with solutions and we can be fortified against any hardship that comes our way. In CBT or ‘Cognitive Behavioral Therapy’ – a more modern approach to psychology – the objective is to look at negative thoughts and beliefs and then challenge them and remove them. Let’s take a look at that ‘debt’ situation again, shall we? Sure, it’s not ideal. But the worst case scenario is that you would lose your savings and go bankrupt. You might be forced to sell your house. But would you be homeless? No: you’d be on benefits. What if for whatever reason you weren’t provided with housing? Then you’d probably move in with your Mum, or with a friend. What if you couldn’t find work again? Well then, you could always work for a friend – or you could start a business. The point is: there is always a way. And yes life can be tough but that’s just part of its charm. It’s like a test and if you have a plan and you’re willing to put in the work, then you’ll be fine. Once you know this, you can tap into reservoirs of power and strength you never knew you had. And if you do the reverse: if you use visualization to picture the reason you’re doing what you’re doing and to see the tangible reward at the end of the road, then you can dip into an incredible well of motivation, creativity, power and determination. This is how you unlock the true potential of the brain and how you can achieve flow states and untapped power. In the full guides, we delve into all this in much more detail, so check it out and start using your brain to its fullest potential. Or go and put some of this advice into action and see just how much potential you’ve been missing out on! 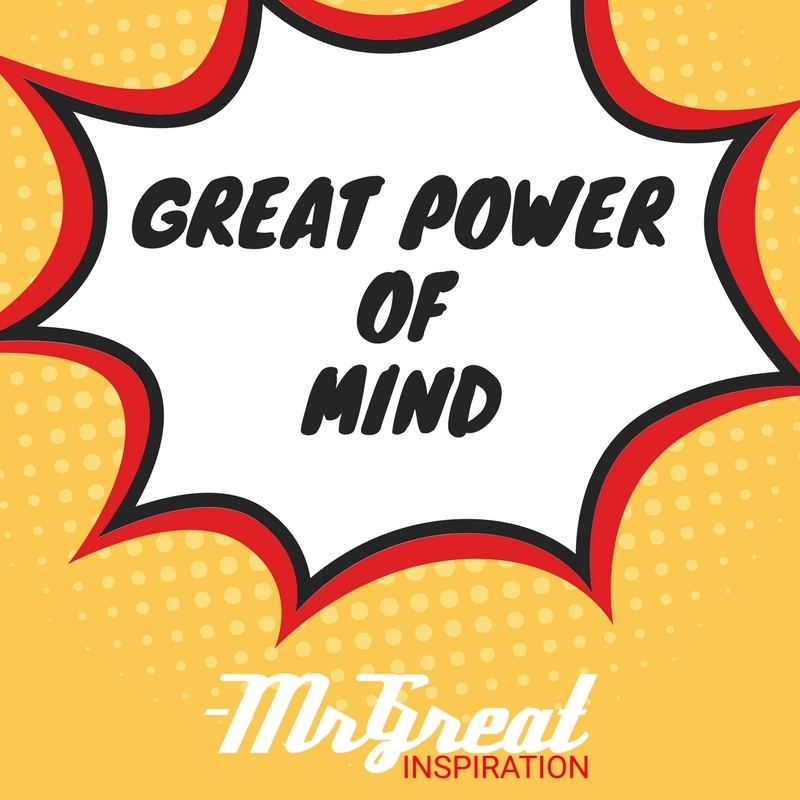 We hope guys you find our article "Great Power of Mind " by Mr Great Inspiration useful.